New York, New York, — Basil Harris, CEO, Dance Mogul Magazine, has been appointed to serve as guest host for “Compete To The Beat,” New York’s majestic street dance showdown. The event takes place Friday and Saturday, July 26, and 27, 2013 at PMT, 69 West 14th street, 3rd floor. 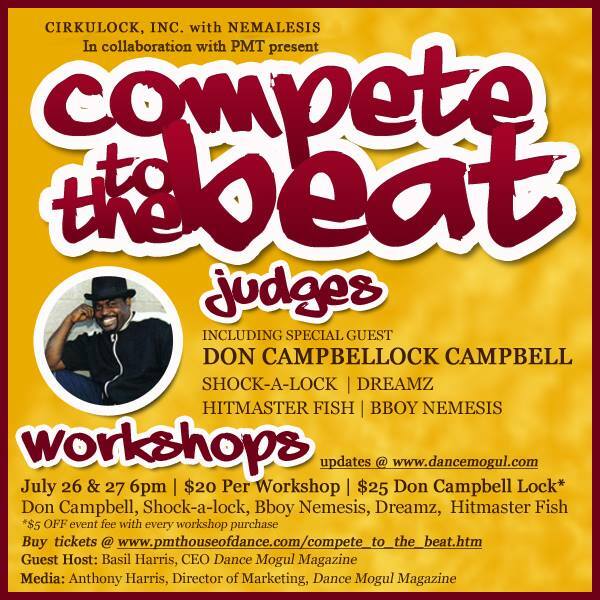 It starts with a series of workshops: legendary Don Campbellock Campbell, creator of locking, Hitmaster Fish, innovator of popping, Shock-a-lock’s “Locking Out Loud,” teaches how to stand out, Bboy Nemesis’ “The Power of Music,” and “New York Krump King, Dreamz leads “Fundamentals of Krumping. 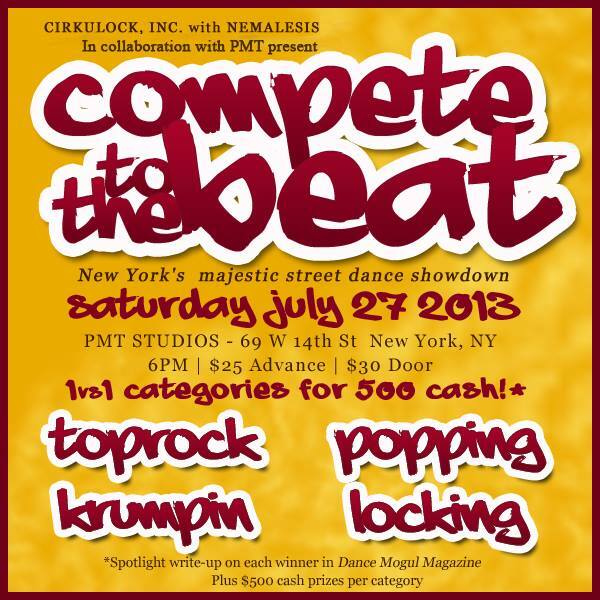 Shock-a-lock, legendary street dance coach, is the coordinator of the event, via Cirkulock, Inc., who has collaborated with PMT and Nemalesis to bring this new dance competition to a new generation of aspiring street dance moguls with purpose. “We know that the street dancers and fans are excited about the upcoming event,” said Shock-a-lock. They have long awaited an event that would offer them a little more than cash prizes. They’ll also be recognized for expressing themselves in a professional, creative manner, minus some of the so-called rules. “Each winner will receive a $500.00 cash prize, and a spotlight write up/interview in Dance Mogul Magazine,” said Anthony Harris, Director of Marketing. Basil and other collaborators agree that by uniting our purposes: inspiring self-empowerment, stimulating creativity, improving rhythm, and living your dreams, dancers walk away with a renewed sense of their own purpose This serves to help them realize their dreams, and that’s “price-full,” to coin a new phrase.